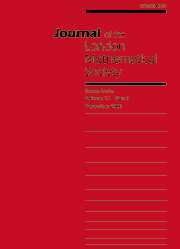 Founded in 1926 and now in its Second Series, the Journal of the London Mathematical Society has a reputation for publishing some of the highest quality research on the whole spectrum of mathematics. The journal has a wide scope which ranges from number theory to functional analysis, from finite simple groups to the mathematical foundations of quantum theory and from logic and topos theory to the topology of Lie groups. In 2006, Cambridge University Press are delighted to support the London Mathematical Society in the introduction of a year's trial open access policy, in which the most recent two issues will be freely available online as part of a one year experiment.